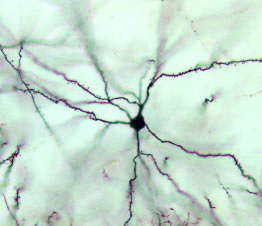 Brain neuron of a quail Coturnix japonica stained with Golgi silver impregnation method. Photo by D.K. Obukhov. Welcome to The Atlas of morphology of the animal nervous system! This atlas is a result of many years of research by scientists studying the nervous system of animals. The atlas is based on photographs made by leading specialists in various groups of invertebrate and vertebrate animals ranging from cnidarians and flatworms to insects and mammals. Some of the photos in our Atlas are shown on this page. The collections of photos of the nervous system with detailed explanations and annotations can be found in the Images section. A versatile interactive search engine will help you select photographs by the animal group, by the organ of the nervous system or by the staining technique. A system of cross references will help you find additional information on all the topics you are interested in. Our website is not only a reference guide to the nervous system of animals, but also an interactive encyclopedia of its morphology and research methods. 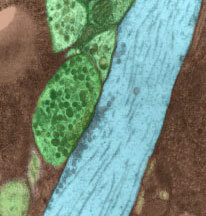 The Methods section presents all main research techniques including classical methods such as silver impregnation and methylene blue supravital staining and modern methods such as immunocytochemistry and confocal microscopy. The Animals and Evolution sections provide information on main animal groups and on morphology and evolution of their nervous system. The Ontogeny section gives an overview of the development of the nervous system and the Models section explains how animal models and their nervous system are used to address the questions and problems of modern neurobiology and developmental biology and to develop novel techniques for bioindication and biotesting. Our guiding mission is to show the beauty and harmony in the structure of the nervous system in all its extraordinary diversity, from simple nerve nets to the astonishingly complex brain of vertebrates. We also hope that our atlas will become a valuable source of information for biology students, for researchers studying the nervous system, and for scientists seeking new animal models for their studies. The project is funded by the Russian Foundation for Basic Research (grant 15-29-02650 ofi_m). 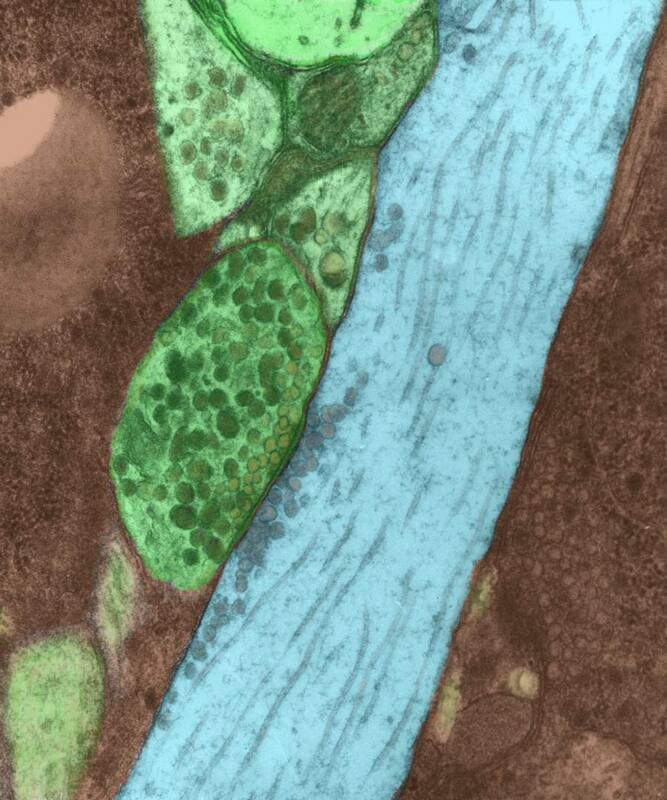 Electron micrograph of an en passant synapse in the brain of a slug Limax maximus. Photo by O.V. Zaitseva. Ganglion of the ladder-like ventral nerve cord of a leech Hirudo medicinalis. Methylene blue supravital staining. Photo by V.V. Starunov. 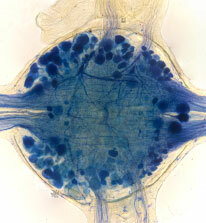 Innervation of the pharynx of a turbellarian Microdalyellia picta. Muscles: green, nerve fibres (tubulin): yellow. Photo by A.A. Petrov. 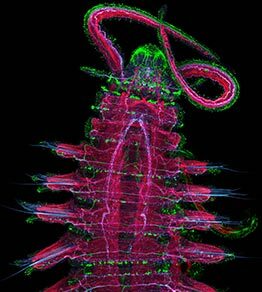 The anterior end of the body of a polychaete Schistomeringos japonica. 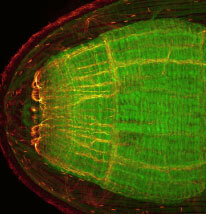 Muscles: red, nerve fibres (tubulin): magenta, serotonin: green. Photo by V.V. Starunov. Histological preparation of the brain of a hedgehog Erinaceus europaeus. Photo by D.K. Obukhov.